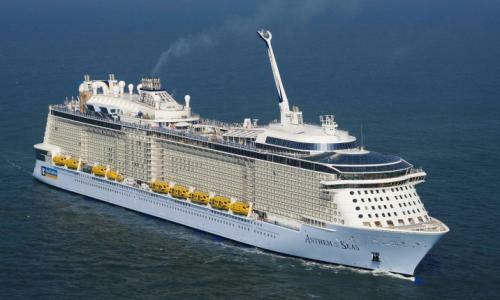 Royal Caribbean's Anthem of the Seas had its high-speed internet access enabled while the ship is in the Mediterranean, according to O3b Networks. O3b uses a new type of sattelite internet that reduces latency, increases internet speed and improves voice and video quality for the user. O3bMaritime has already provided four of Royal Caribbean’s ships (Oasis of the Seas, Allure of the Seas,Quantum of the Seas and Anthem of the Seas), each with more bandwidth than the rest of the cruise industry combined. In the near future, Royal Caribbean’s Quantum of the Seas will move across the Pacific, bringing exceptional cruising experiences and at-sea high speed broadband to the Japanese ports of Okinawa and Kyoto, as well as other Asian destinations. Royal Caribbean President and CEO Michael Bayley commented on the partnership with O3b, "With O3b we have added a dimension to cruising that has never existed before. Our new internet capabilities allow our guests to surf, stream and share their vacation experiences with their friends and family back home. It also allows us to provide our business clientele a new way to stay connected with their colleagues." Being healthy and active onboard a Royal Caribbean cruise ship is easy with activities such as rock climbing, roller skating, and even simulated skydiving. Biggest Loser and award winning chef, Devin Alexander stays active with all these activities and more onboard Anthem of the Seas. 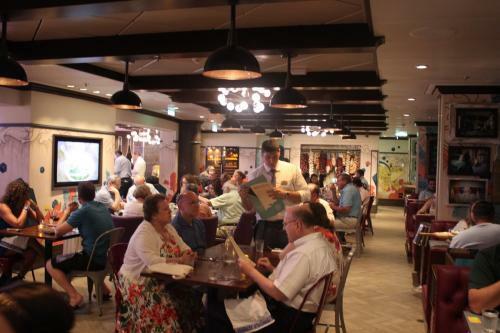 Royal Caribbean has reversed a change on its newest cruise ship, Anthem of the Seas, by going back to a cover charge at its Jamie's Italian specialty restaurant. The cover charge for a meal at Jamie's Italian will be $30 per person. Cruise Critic is reporting Royal Caribbean brought back the cover chanrge instead of an a la carte pricing structure. When Jamie's Italian first debuted on sister ship Quantum of the Seas, the restaurant featured a cover charge but when Anthem of the Seas debuted, the restaurant pricing shifted to an a la carte structure. According to Cruise Critic, the decision to go to an a la carte pricing in the first place was made by Jamie Oliver's team. Royal Caribbean has extended its offer on Anthen of the Seas, where guests can get a balcony for the price of an ocean view stateroom, plus 50% reduced deposit. Guests can book a balcony stateroom on Anthem of the Seas for the price of an ocean view stateroom at standard/full fare. The "Rock Your View" offer is valid on new Caribbean and Bahamas itineraries on Anthem of the Seas sailings departing between November 10, 2015 – April 18, 2016. The 50% reduced deposit is applicable to all stateroom categories. Offer available to residents of the United States and Canada and must be booked by June 30, 2015.